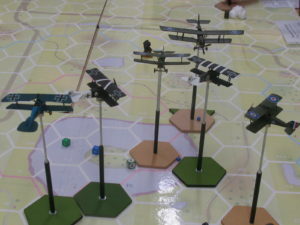 The Royal Air Force won a decisive victory against the outnumbered German Imperial Air Service in the club 1918 Knights of the Sky game this week. 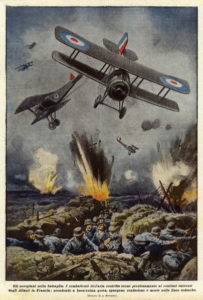 Despite an aggressive and effective defence by the pilots of Jasta 5, the Allied British and Belgian aircraft managed to knock out four out of five ground targets, with a Croix de Guerre being awarded to the lone Belgian pilot in his Hanriot HD-1 for exceptional trench strafing skill. Thanks to everyone who took part. 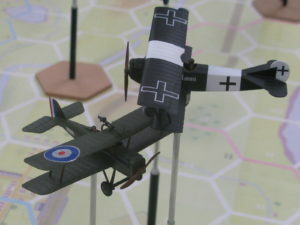 There will be another game in the run up to Xmas, which will be a seasonal scenario set in late 1917, setting the Royal Flying Corps and Aviation Militaire against the Luftstreitkräfte over the trenches of the Cambrai salient. 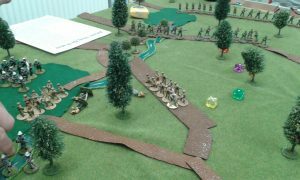 The Germans will be counter attacking and will get the chance to do some trench strafing of their own this time round. More details will be posted closer to the event but you have plenty of time to glue together an Airfix, Esci or Revell model plane for the game! 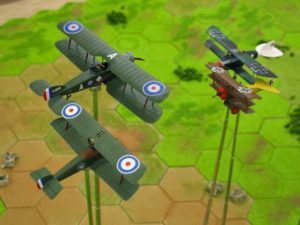 I say old chap, on the 17th October there will be a multiplayer WW1 aerial game using the excellent club house rules Knights of the Sky. The date is set for October 17th 1918, in the closing weeks of the war on the Western Front. 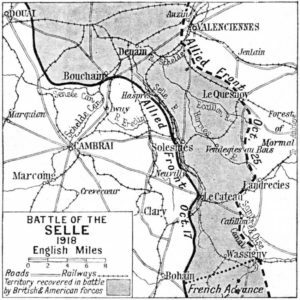 The British, Americans and French are about to launch an offensive on the River Selle against the German front line. In support of this assault, the RAF will be flying a ground attack mission by Sopwith Camels, with top cover from Se5a’s. 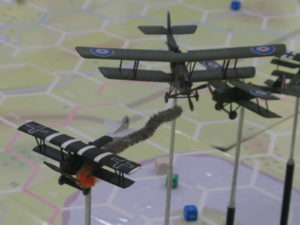 The Germans in their Fokker DVII’s and Albatros DVa’s will be tasked with interception of the ground attack aircraft and disruption of the covering RAF scout machines. The odd Belgian may also be stooging around looking for a chance to settle some scores. There are ten players signed up for the game but one place still remains for any aviators who want to Bag a Hun or Down a Tommy before the war ends. All aircraft models, rules and record sheets wil be provided but, if you have your own flight stands, then they would be very handy. 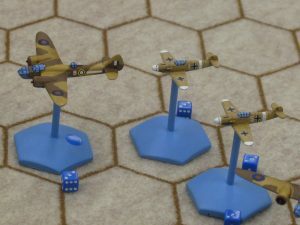 The Bag the Hun Two club multiplayer game, set in the skies over Berlin in April 1945, ended in a decisive victory for the Allies despite being slightly outnumbered by the Luftwaffe. The Spitfire XIV’s of 610 Squadron did particularly well, using a combination of the ‘bounce’ and close range cannon fire to great effect. A DFC has been awarded to P/O Renfrey in recognition of his skill and leadership. Jolly Good Show! 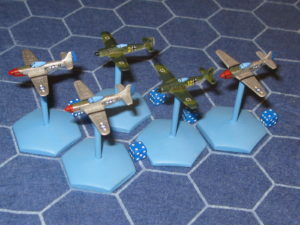 Not to be outdone, Chuck and Bud of the 336th Fighter Squadron flew their P-51D’s in true ‘Rocketeers’ style, blasting the Krauts out of the sky. Although Bud has as yet failed to return from the mission, it is likely that he may have survived a crash landing in US held territory, so has been awarded a Purple Heart for wounds sustained in action. Yee Ha! The Soviets also achieved some success in their light and agile La-7’s, and have claimed fourteen anti-fascist kills for no loss in he latest edition of Pravda! Major Martynovski has been awarded the Order of Lenin with dangly bits for his demonstration of inevitably superior proletarian tactics and for trouncing the decadent western capitalists at their own game. Huzzah! However, it was a disappointing dogfight for the Jet Jockeys of 616 Squadron, whose Meteors failed to live up to expectations (although they didn’t actually blow up or plummet to the ground in a flat spin). The boffins at Farnborough are expecting a full report from Squadron Leader Stephens, as soon as he lands, in order to explain the Meteors apparent lack of air to air combat success. I say old chap, bad show! 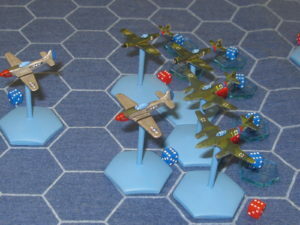 The Luftwaffe put up a stiff fight but, unfortunately, ran out of time and fuel by the end of the game. The Fw190D ‘Dora’s did perform well and were able to hold their own, with the Me262’s also contributing to Allied losses. The late arrival of Fw190A8 and D9 reinforcements was just too late to swing the balance in the Luftwaffe’s favour. In the final analysis, a lack of co-ordination and some serious ‘spotting’ failures meant that the enemy were able to inflict some telling damage on the Luftwaffe defenders, including the loss of the Top Ace Me262 rotte leader. Donner und Blitzen!!!! There’s a Bag the Hun 2 game on the 26th September. This will be an April 1945 free for all dogfight over the outskirts of Berlin featuring the RAF, USAAF, VVS and, last but not least, the remnants of the Luftwaffe. If you’re coming along, please bring a pen or pencil and plenty of D6. If you have your own copy of the rules that would be really handy. Jim will provide all the aircraft, record sheets, cards and tiddly dice. 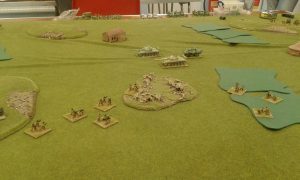 We went back in time to play a set of rules printed in the early Miniature Wargames magazine under the title Drums Along The Watusi in the Rules on a Post Card series. We used the figures we had to give the rules a try. The terrain was dense jungles with tracks and open spaces. To represent this, we placed dark green areas to represent the open areas and brown tracks. Everything else was dense jungle. 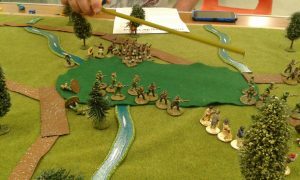 We used our Back of Beyond figures and some British Naval figures to make an international Brigade making their way across the table to the river where boats awaited. Movement was by throwing 2D6 with an ambush occuring on a result of 11 or 12 in the jungle or 10, 11 or 12 in the open (on the tracks and clearings). Movement was 2 times the result if in the jungle or 3 times on the tracks and through the clearings. 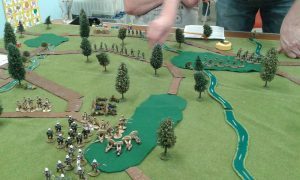 The British headed off through the jungle and made slow progress without encountering the natives until they were two thirds the way across the table. 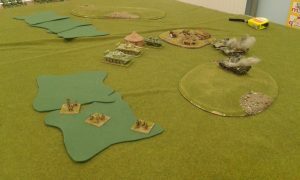 The Japanese contingent made slow progress the first turn but their rear unit was ambushed on their second move. The Chinese moved even slower to start with, avoiding ambushes until they were half-way across the table when they were fired upon by the Japanese who mistook them for natives, and were then ambushed by the natives to add to their misfortune. The Japanese tried to redeem themselves by coming to their aid. 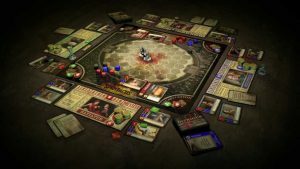 It was the French who were immediately ambushed and for the first few turns, continued to have to fight their way across the table with more ambushes each turn. 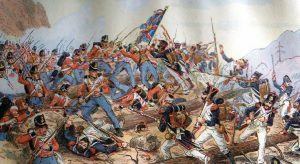 One ambush came from an area that the British had just passed through, leading to accusations of the British being in league with the natives. 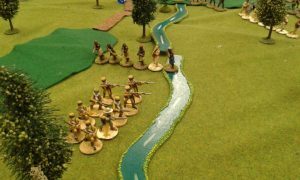 Despite the differences in the movement rates and the number of ambushes each nation suffered, they all arrived at the river with one turn of each other. A very enjoyable and fun game with simple rules. Elements of the People’s Liberation Army were discovered in the interior of Bana Soto by elements of the Army of Bana Soto (ABS) who engaged them whilst calling for support. The enemy force was identified as a large contingent of infantry with machine guns supported by three tanks (the infantry were militia and these were the only two units who made it to the table in the deployment phase). Opposing them were two units of the ABS, three tanks of regulars and three mortars which were also the only forces to make it to the table in the deployment round. 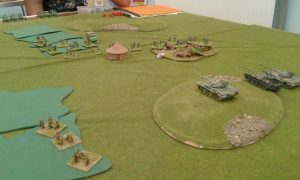 The ABS concentrated their attack on the infantry causing casualties and moral checks, whilst the PLA tanks raced to the aid of their allies rather slowly. Neither side succeeded in gaining any reinforcements on turn 4 and the PLA infantry’s morale failed and they fled the field but the PLA tanks succeeded in destroying the ABS tank who were dismayed to find that they had loaded the wrong ammunition, not having expected to meet other tanks. 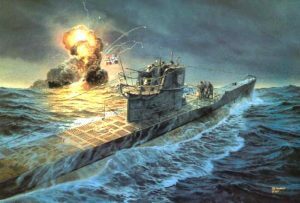 The first reserves to appear were the Commando Early Reaction Bana Soto force (CERBS), but they were not in time to save the tanks of the ABS, which were destroyed by the PLA before discoverying they had also failed to load sufficient ammunition. By this time, the remaining ABS forces had appeared and began advancing to surround the tanks. 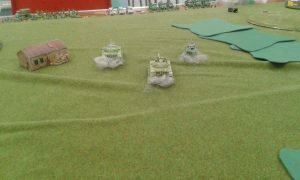 Deciding that it was best to live to fight another day, the PLA tanks decided to withdraw at speed. 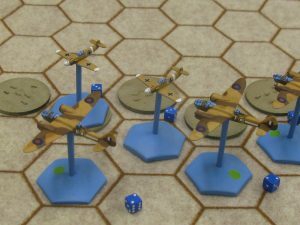 The Buchanan’s Party scenario for Bag the Hun 2 was played at the club this week, with seven players taking on the role of Luftwaffe and RAF aircrew. In the end, the experienced Luftwaffe pilots of Stab III.JG27 shot down two No229 Squadron Hurricanes of Yellow Section, one in a catastrophic mid-air explosion and the other in a gradual slow glide down to earth to crash land in the desert. They didn’t manage to shoot down any of the No14 Squadron Blenheims, however, which succeeded in dropping three sticks of bomb on the convoy but only destroyed one of the target markers in the process. In addition, one of the Bf109 F-4’s suffered a gun jam and was effectively out of the game by Turn Three. The Victory Points worked out at four for the Luftwaffe but only one for the RAF, so a clear Axis victory. We did run out of time though, so it would be fair to expect that several of the bombers would have exited the table in Turn Six to claim additional VP’s. 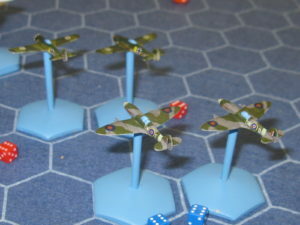 Even though the RAF fighters had a rough deal, due to an unlucky turn of the cards and some dodgy dice rolls, they did succeed in their mission objective to protect the bombers so that they could hit the target. …more Bag the Hun to follow soon.